My mid-2011 Macbook Air‘s SSD died last week. I’d spent a lot of time setting this up just how I wanted: dual boot OSX and Win 7 (then Win 8) – 50Gb for each OS, and a 150 Gb shared exFat “Data” partition which is writable by both OS. The Data partition contained all my music, photos, and source code. OSX backed itself up automatically to my Time Capsule using Time Machine. Windows I never backed up because I don’t mind re-installing a new Win machine in the event of failure since it’s a good chance to start from scratch and get rid of old crap – old versions of Visual Studio etc. The Data partition – the most important one – I backed up manually both to my Time Capsule’s shared network disk and an external USB drive, using Syncback Free. I’d usually do this once or twice a month. Cue the usual ranting and gnashing of teeth. Every day I’m not working is a day I’m not getting paid (contractor, ya see). All of the Mac service centres in London promised a 3-5 working day turn around, because they would have to order in a replacement SSD. Which means I’d have to make an appointment with the dreaded Genius Bar since they probably would have the part in stock. The staff at the Genius Bar are always great, but I HATE the process you have to go through to see them – booking an appointment online. To cut a long story short, I was able to get a walk-in appointment later that day, and because I had AppleCare (which I bought specifically because SSDs are unreliable), the £600 replacement part cost me £0. But it still cost me a day’s productivity (and pay!). In terms of lost data, not a lot. I lost a Linux VM which I could rebuild in about a day. Source code is on git / svn servers so none. Personal data – some photos of a trip to Portugal but I was able to get lower res copies of most of them from Facebook. Everything is on the one Macintosh HD partition. However, old habits die hard – I still have the content of my old “Data” partition located at /Data on that hard drive, organised how I like it to be and not how OSX wants me to have it organised. Time Machine + Time Capsule now backs up everything automatically when I get home. Super Duper backs up and creates a bootable version of my Macintosh HD on an external USB drive. This means that if my SSD dies again, I can boot straight off the USB hard drive and carry on working. At the moment I’m doing this every night, which takes about 20 mins (using the Smart Copy – I purchased a license). But if I think about it, once a week or so should be adequate since my personal files should be getting backed up by Time Machine, and I usually commit / shelve source code every night. I still feel a bit uneasy about running Windows in a VM, but lately I’ve only been using OSX at work. I’ll see how it goes when I start coding in .NET again in a few weeks. 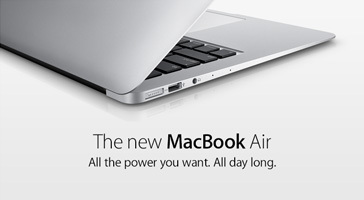 A few days ago I bought a new Macbook Air. I went for the fully pimped one which comes with an i7 and a 256Gb SSD. With the VMware Fusion demo I was able to bring my old laptop over and run it as a VM inside the Mac. 2. It looks like I don’t need to buy a new Windows license. So far my VM hasn’t phoned home to Microsoft – maybe it will? 3. For networking, although I’m connected on WiFi to my flat’s network on the Mac, the VM sees it as an ethernet connection. Initially I couldn’t connect to the network on the VM because it was complaining that there were no ethernet drivers installed. I had to edit the .vmx file and add a line ethernet0.virtualDEV = “e1000”. 4. 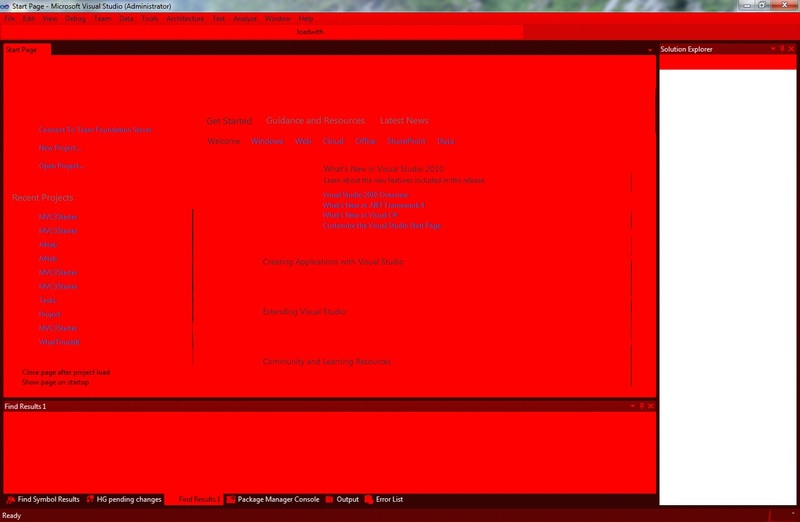 Visual Studio is completely red and unusable! I haven’t figured that one out yet. The Visual Studio red problem I had was with VMWare Fusion 3 and Parallels 6, but it seems to be fixed in VMWare Fusion 4 and Parallels 7. Having said that, I don’t use virtualisation and reboot and run Win7 in Boot Camp. I was recently working on a legacy ASP.NET application which was taking like 30 seconds to load a simple page with a Gridview. The culprit was Linq to SQL lazy-loading combined with an inefficient architecture. By tidying that up I was able to get the page load time down to about one a second. I could have stopped there but I thought it would be nice to see if the SQL performance could be improved further. 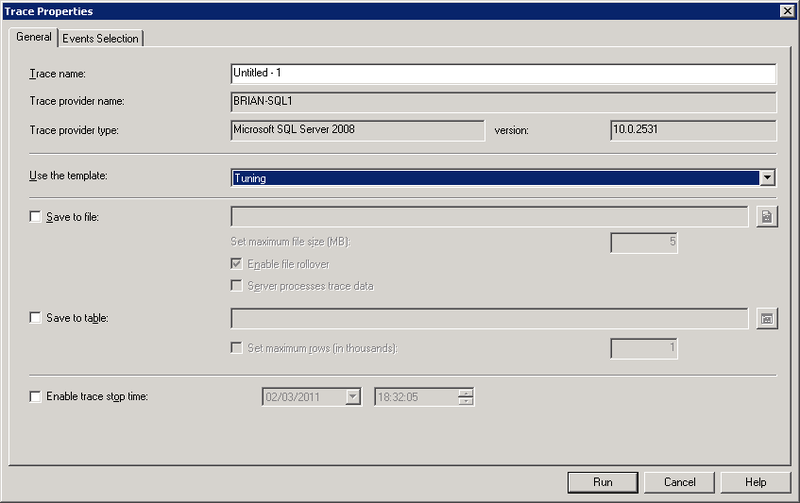 Start SQL Server Profiler and create a new trace. Choose the "Tuning" profile. 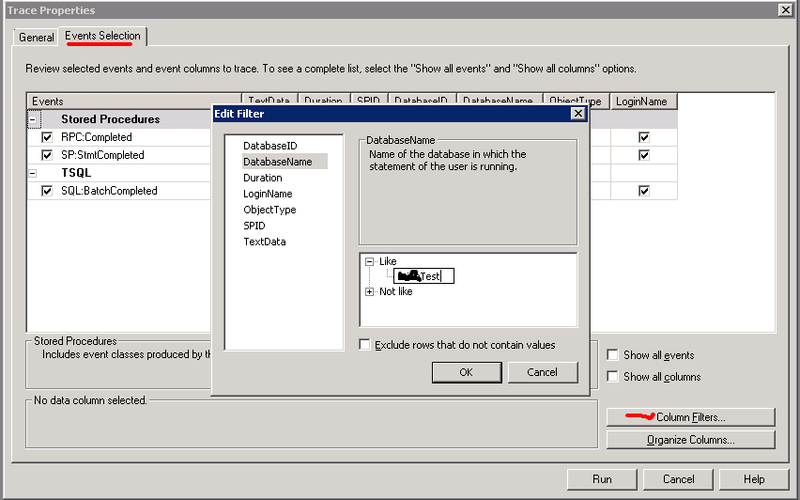 If your database server has more than one active database on it, you will want to choose to filter activity to your database only. Once the trace starts recording, go to your website and hit the page you are trying to improve. In my case it was a page listing Help Requests, so I hit that page and did a couple of searches. Stop recording the trace and save it. I called mine “help requests.trc”. 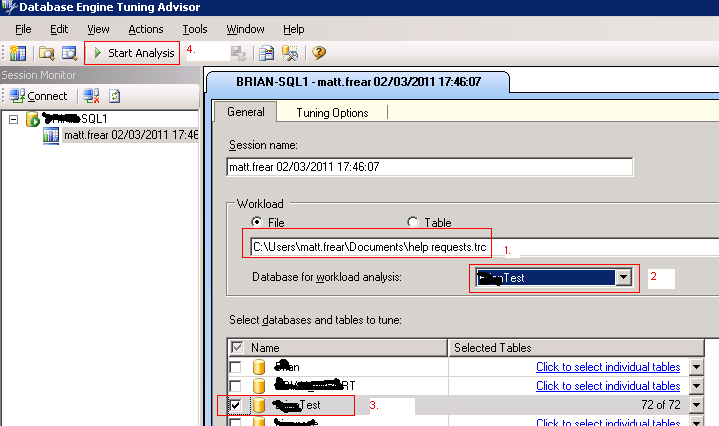 Start SQL Server’s Database Engine Tuning Advisor. It will automatically start a new Tuning session when you connect to your database. Choose your trace file that you’ve just recorded (1), choose your database (2), tick your database again (3), and finally hit Start Analysis (4). Oops, that’s not quite right. It’s reporting errors, "SHOWPLAN permission denied in database ‘DBTest’"
Now run the trace again, and you should see the recommendations screen. As you can hopefully see, SQL Server recommends creating 4 indexes and a bunch of statistics, and estimates a whopping 92% speed improvement! Press the Save recommendations button in the toolbar to save those recommendations to a SQL script which you can review and tweak, and then run that script against your database. I had another play with Resharper at work recently. There’s lots I like about it, for example the code suggestions, and the way it grays out unused functions and unused branches in methods. It’s really good for tidying up legacy code. And “Go To Implementation” is a massive time saver. There’s a few things I don’t like about it. I don’t think it’s Refactoring options are much better than those built into Visual Studio – I only ever use Extract Method anyway. And I don’t like its “Find All References”. Anyway, when the trial ran out and I uninstalled it, I found I’d lost my Intellisense squiggles (under Syntax errors and the like). To turn them back on, it’s under Tools –> Options –> C# –> Advanced. 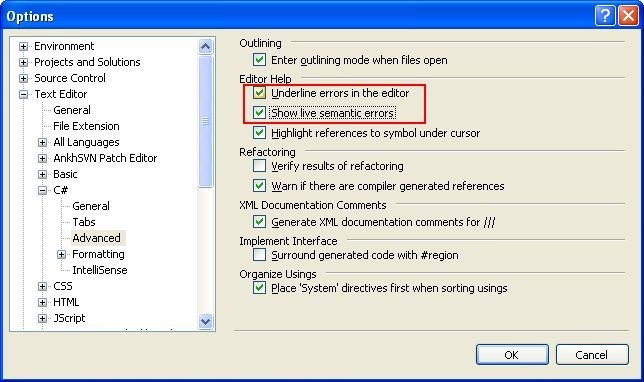 Check “Underline errors in the editor” and “Show live semantic errors”. Since I work in IT, I’m occasionally asked to do tech support for family and ex-girlfriends, even though that’s not my area of expertise. Yesterday a friend had a problem I’d never seen before. After bootup, she would be presented with the standard Windows XP login screen, with only one user account available for login. She clicks her name, enters her password, and then gets a message “your password has expired, you must enter a new one” or however the exact text goes. So she enters a new password but then gets “You do not have permission to change your password”, which prevents her from logging in and takes her back to the login screen. After trying a few different things to no avail, I tried googling the problem on my iPhone. But I couldn’t even find anyone with the same problem, let alone a solution. 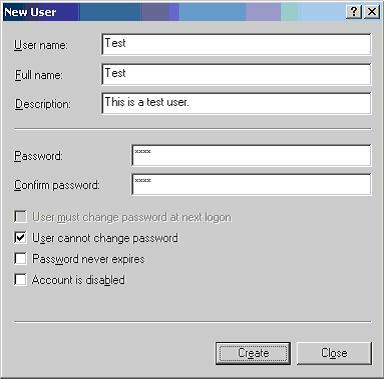 I tried booting Win XP into safe mode, and luckily at the login prompt I could now choose to login as Administrator (with no password!). Once inside I checked the account my friend was trying to login as, and sure enough the “User cannot change password” box was checked, and the “Password never expires” box was unchecked. I restored the settings back to how they should be – password never expires and user can change the password. So that fixed the problem, but I was still wondering how those settings got set like that. My friend sheepishly admitted that she’d been playing around with those settings a while ago when she had password problems with her ISP. D’oh!